A week ago at the time of writing this, I had an email from Philip Marsden, one of our prized Archipelago contributors. He told me: ‘I leave for Dingle at dawn on Friday’. It was the stirring opening to a poem, for sure, the ring of Auden’s ‘Leave for Cape Wrath tonight’ about it, though none of the period desperation. By now he’ll have that first leg of his single-handed voyage from Falmouth to the Hebrides behind him. We hope to rendezvous up there somewhere weather and time permitting. But whether we can or cannot, he will have had the better part of it by many a sea-mile. I can only imagine what poignant and vigorous wonders there’ll be in his log. Just as I heard from him I was sorting out a trip of my own, to take part in the Inishbofin ‘Island Conversations‘ Festival (2-6 June 2016), an event organized by Peadar King. I believe I’ll be there in the company of Norman Ackroyd, Michael Longley, Bernard O’Donoghue (all long-term supporters of Archipelago) and a host of others, and I thought it the moment to give you advance notice, to encourage you to book your place and support this vital fledgling project. 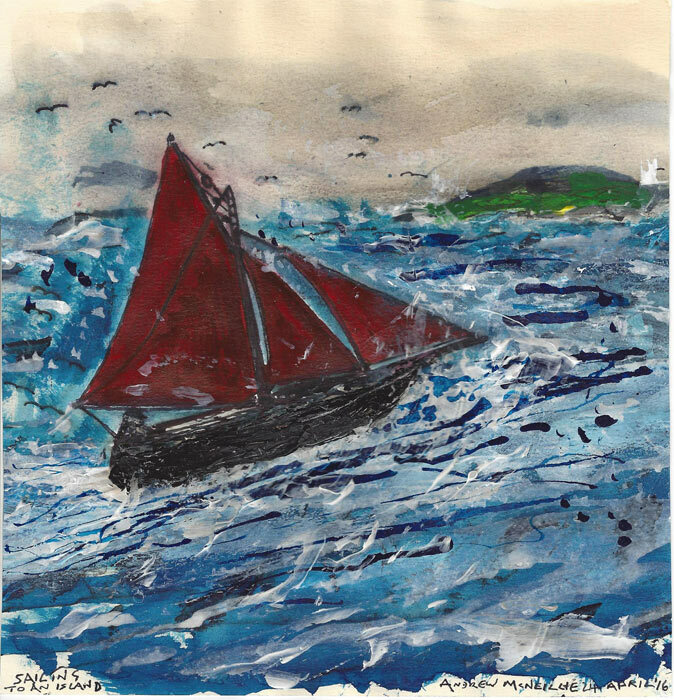 Inishbofin is of course indelibly associated with the Irish poet Richard Murphy and above all his landmark-seamark volume Sailing to an Island (1963). Murphy is the unacknowledged legislator behind the Archipelago venture, which itself first surfaced in November 1968, at Cill Rónáin harbour, Árainn – long-ago now when the fishing, while not what it once was, was far better than it is now in the threadbare seas of today. She holds nothing steady on land or sea today. But what-ho! proclaims, What-ho! her name. Gulls in mobs clamour in the gods. spouts and spouts again all morning. to hang on a handlebar for an encore. If you do not know Murphy’s work – shame on you, until you obtain his collected poems from Antony Farrell at the Lilliput Press (which includes some notes on the poems by the poet, and a piece by Bernard O’Donoghue on ‘Pat Cloherty’s Version of The Maisie‘).